From the third century B.C. (the Hellenistic Period following the destruction of the First Temple, during which the Greeks occupied the Land), the Amphora jug-shaped pot is evidence of widespread trading of wine and oil conducted between all parts of the Mediterranean by Phonecian sailors. Amphoras are often discovered on the shores of Israel in the remains of ancient shipwrecks. They are large vessels (about four times the size of Antika's amphora) with two earlike handles and a conical base enabling comfortable carrying and secure storage. Their origin is thought to be found in the Aegean Islands. The original amphora (on which Antika's is modeled) is on display today at the Museum of Ancient Art in Haifa. It was chosen for presentation in the United States by the Smithsonian Institution. 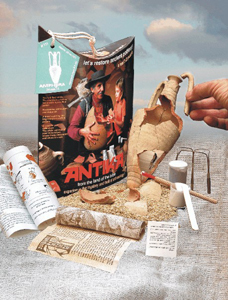 The Amphora Pottery Kit contains: • potsherds buried in sand; • glue (for sticking together potsherds); • paintbrush (for applying glue); • plaster (for filling in holes); • spatula (for applying plaster); • balloon (for applying plaster in some pieces); • complete instructions and a welcome to the world of archaeology by Perli Pelzig (English & Hebrew); • scroll explaining the beginnings of ancient pottery (English & Hebrew); • a museum card containing interesting information about the origin, usage, and history of your pot (English & Hebrew). Assembled Size: 4.5" X 4.5" X 15"